First Impression: Beautiful, peaceful and quaint, the village of Glendale is like a Norman Rockwell painting come to life. Unlike a typical sprawling suburb, Glendale is a tiny community, with a population of 2,170 people in an area of 1.7 square miles. With tree-lined streets and active wildlife (most notably squirrels), Glendale almost resembles a giant park. Second Look: Once a safe haven for runaway slaves and a major stop on the Underground Railroad, Glendale is now an escape for world weary citizens seeking a respite from the rat race. Incorporated in 1855, the village of Glendale is a tranquil, historic neighborhood with palatial Victorian mansions and a distinct colonial charm. Glendale is the only village in Ohio to have been deemed a National Historic Landmark. Strolling along the serene streets or passing through the town square, one can easily imagine what it might have been like to live during the early 1900s. One can traverse the entire neighborhood in half an hour, and the long, flat streets make an ideal stretch for joggers. Glendale possesses the calm, picturesque feel of many historic towns that are often listed among recommended day trips from the city - however, at only 15 minutes from downtown, Glendale is a short drive from anywhere in Cincinnati. Browsing through kitschy shops, dining in high quality restaurants or just generally taking in the peaceful atmosphere makes a pleasant pastime for residents and visitors alike. Those who live in Glendale appreciate the old-world feel, the slower pace of life, the ample green space and the safe streets. Being so small, the community is very close. Anyone interested in purchasing a house should be aware that because many of the buildings are historic, any renovations have to be done in accordance with certain guidelines. 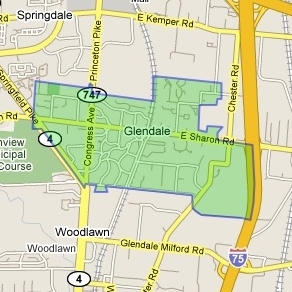 Another point of note (that residents enjoy) is that the village does not charge any earnings or income tax; Glendale's public services are supported by property taxes. Parents will also be happy to know that the Princeton City School District serving Glendale is nationally recognized for its advanced curriculum and comprehensive programs.